Asics GT 2000 4 are stability cushioned running shoes. 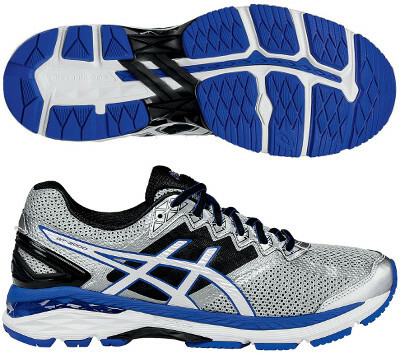 The Asics GT 2000 4 is the most recent update of the popular GT Series well known for great value for money. It is placed one step below the flagship Kayano 22 among cushioned running shoes with pronation control. If looking for a reliable model for everyday training and long runs at affordable price, then the GT 2000 4 matches your expectations. Major update compared to its predecessor the GT 2000 3 takes place in the upper with new elastic bands in the inner side wrapping around your midfoot for improved fit. Heel counter also gets an upgrade and becomes more prominent featuring better stability. There are several variants available: Lite Show™ with higher density of reflective elements to improve visibility on low light conditions, and Trail with specific outsole to increase grip and durability on every terrain. Cushioning and pronation control are based on what is already available in popular Kayano 22. Midsole features rear and forefoot Gel® cushioning system for responsive shock absorption on impact between bouncy FluidRide® layer on top and stable and durable SpEVA® underneath. Midsole also includes specific pronation control technology (dual density Dynamic DuoMax®) in the internal side to improve stability.